When the first Si badge was slapped onto a Civic way back in 1984, the goal was to inject a healthy dose of sportiness into Honda’s humble compact. 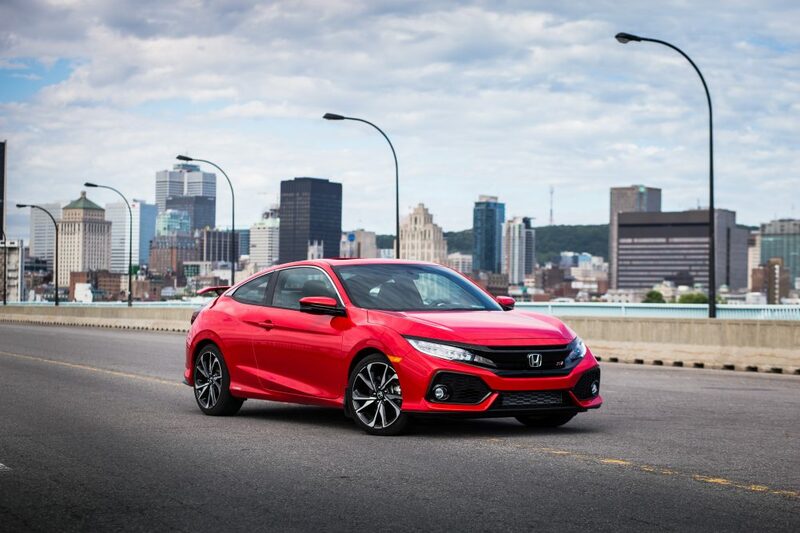 The idea was an instant success, with seven generations of Civic Si that followed, available in all shapes and sizes, from coupes, to hatchbacks and recently, even some sedan versions. 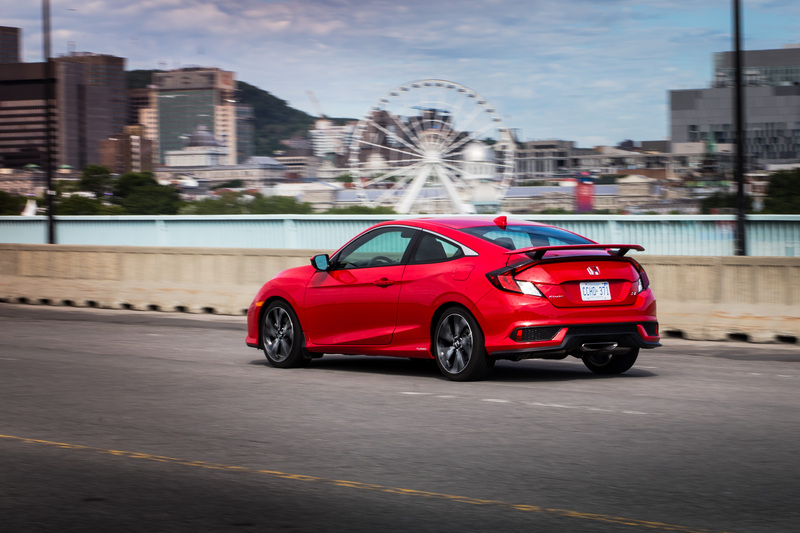 The Civic Si has held the beacon as Honda’s sport compact car here in North America for three decades, taking on rivals like the Volkswagen Golf GTI, and in some cases, even beating them at their own game. 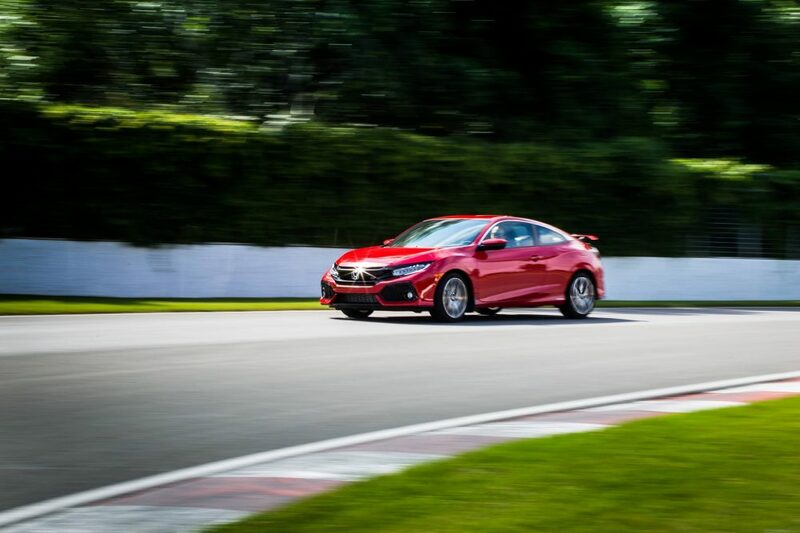 But the Si was never the Type R. That one, available exclusively in Japan and Europe until now, pushed the performance envelop one step further by being a true, lightweight, high-revving purpose-built machine. 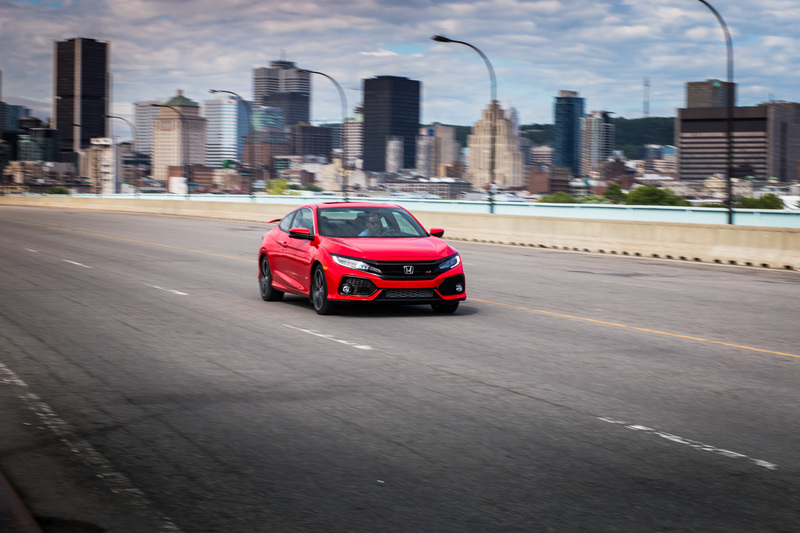 As we North Americans sat here drooling over the hot Civic we couldn’t have, Honda kept spicing up our Si to satisfy our performance needs, to the point where it had become almost as potent as the R.
And now, the Type R is finally available on our roads. It’s more over-the-top than any R-badged Civic that came before it, and Honda is using this opportunity to set the record straight as to what an Si was always meant to be: a sport injected Civic. This new version, now at its eighth generation, may be more different than any Si that came before it, but it’s as close to its roots as it’s ever been. With three Civic variants for consumers to choose from, Honda’s now gone full circle with its popular compact. 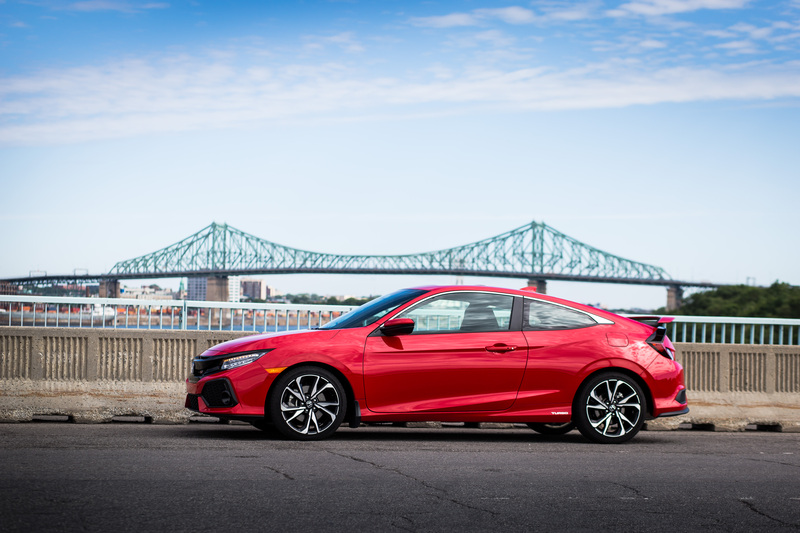 But while North Americans were eager to finally see the hatchback return to our roads after over a decade of absence, Honda is reserving the Si trims for the coupe and sedan. 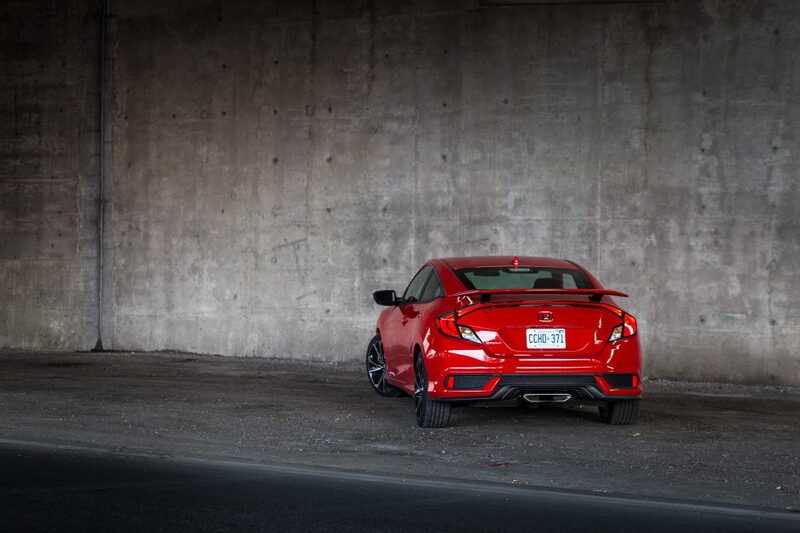 Don’t worry hatchback fans, the Type R can only be had with a hatch. Styling-wise, I’ll personally say the coupe is the better executed design of the Civic lineup, so when Honda Canada asked me which Si I’d prefer for this review, I immediately asked for the one with the slopping roof and wider track. Sure, the Si sedan would have been the more sensible choice, but in order to pay homage to the 1999 Civic Si coupe (EM1), arguably considered to be the best Si (SiR in Canada) ever built, I went for the coupe. Visually, Honda remained conservative with this new Si. Unlike the Type R which looks like it just spent the weekend on Mars, the Si remains rather low-key. The front bumper is a tad more aggressive with larger air intakes to help cool the more powerful engine. 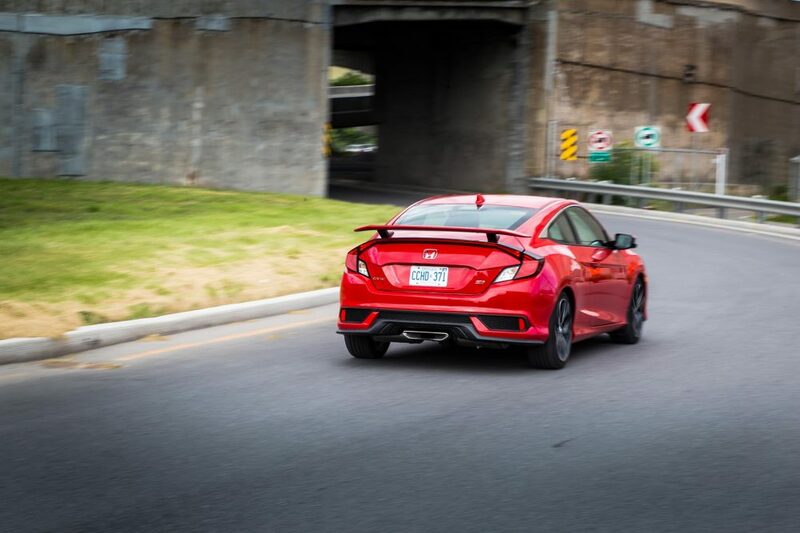 Classic red Si logos front and rear, subtle turbo lettering on each sides of the car, a protruding rear wing and a central exhaust pipe let everyone know this sport compact sits on the hotter side of the Civic lineup. The only real visible mechanical queues that this is a more potent Civic that your mother’s are the standard 18-inch wheels and considerably larger brakes. 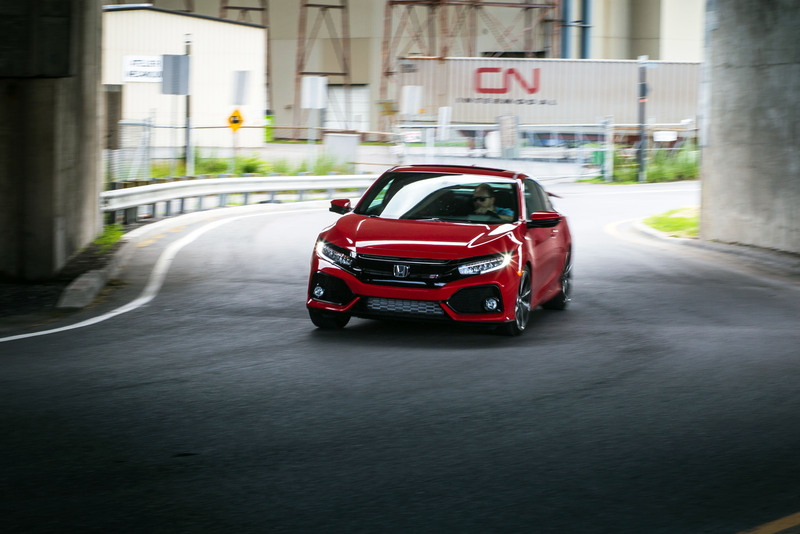 The biggest news for the 2017 Honda Civic Si is what sits under its hood. 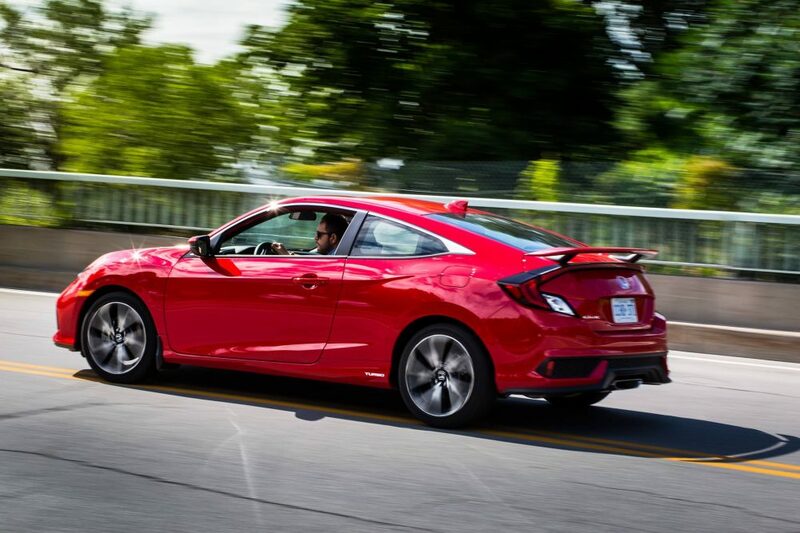 The Si’s defining feature has always been its engine, which wasn’t only completely different than what you’d get in standard Civics, but was always naturally aspirated, with the most potent examples benefiting from Honda’s renowned, F1-inspired variable valve timing technology, or VTEC. 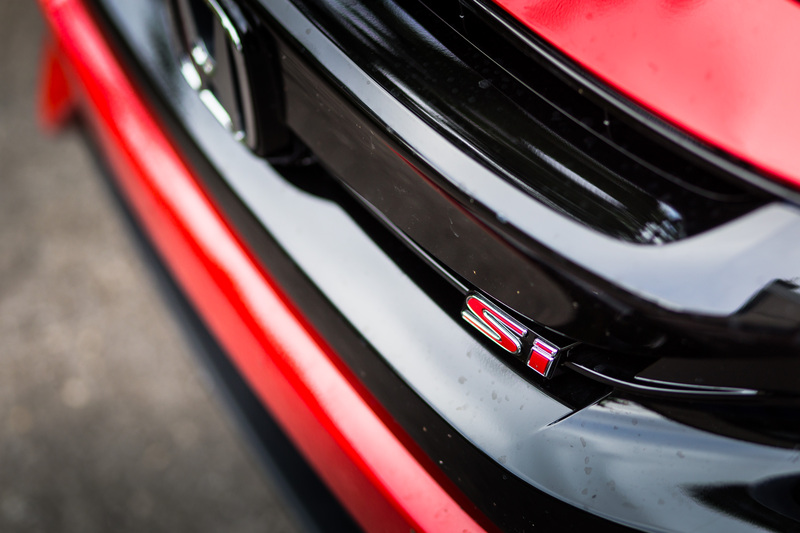 Anyone who’s driven past Civic Si’s knows about the challenges and satisfaction that came with the combination of screaming revs and a slick-shifting manual transmission. We’ve seen Si’s with rev limiters set to 8,200 rpm. But this new Civic Si doesn’t have VTEC. It’s now turbocharged. The engine is Honda’s now familiar, and frankly excellent 1.5-liter turbo that powers all Civic variants as well as the new CR-V. Only the Type R gets its own, bespoke 2.0-liter turbo mill. For the Si, boost was cranked up at 20 psi, an increase of 3.8 over the regular cars. Power consequently goes up 31 horsepower over a standard turbo Civic sedan, and 25 horsepower over the hatchback. Total output is rated at 205 horsepower. While that number is identical to the last generation Si with the 2.4-liter (K24) VTEC engine, torque climbs at 192 lb-ft, versus 174 lb-ft.
That available twist is now available much lower in the rev range at 2,100 rpm, with the car’s curb weight remaining almost identical at 2,879 lb. 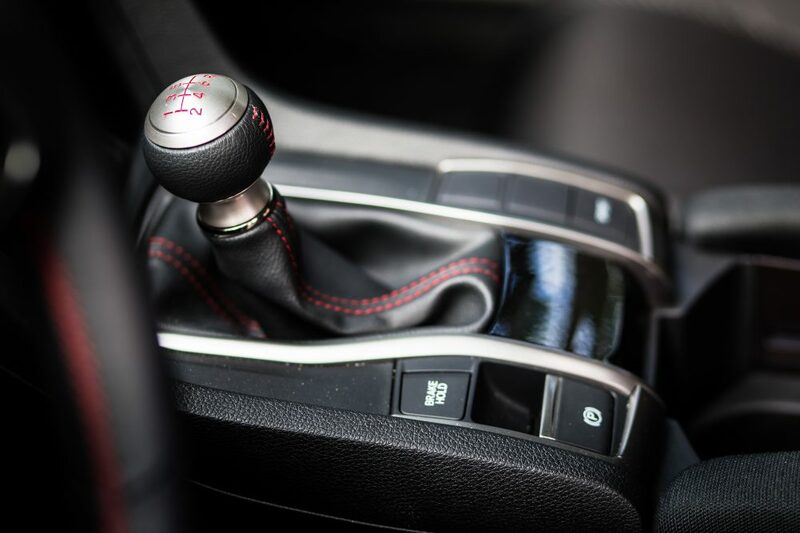 As is traditional with all Civic Si’s, the only available transmission is a six-speed manual. Front-wheel-drive is the only way to get the power down to the road, but a helical limited-slip differential comes standard. Acceleration times to 100 km/h remain neck to neck with the last generation car at a claimed 6.3 seconds. Let’s begin with the elephant in the room: the engine. Yes it no longer sings glorious VTEC melodies, and it will quickly ask for another gear when approaching 6,600 rpm. It also doesn’t sound very special, and gone is the instantaneous throttle response of naturally aspirated Hondas. This one is all throttle-by-wire, which means yes, there’s a lot of rev hang when you lift off the throttle to shift. What this Civic lacks in screams, it makes up for in midrange punch and addictive turbo boost. Gone are the days when you had to drop two gears to get the power down in your Honda. For this Si, you just floor it and she’s gone. Complimentary wastegate noises are also on the house – ptttssss – which I will admit, do sound kind of cool. One thing Honda hasn’t lost is the art of building stellar manual transmissions. The Si’s shifter, while a tad notchier than past Hondas, remains one of the industry’s best sticks to row around. The throws are short and there’s a solid, mechanical feel each time a cog is selected. That ball shifter fits formidably well in the palm of your hand. But the numbers don’t tell the whole story about the way this Si handles. No chassis reinforcement was applied to the standard Civic’s original shell, because it’s already a competent platform to begin with. The only area Honda engineers worked on was the suspension, which gets stiffer springs and anti-roll bars. 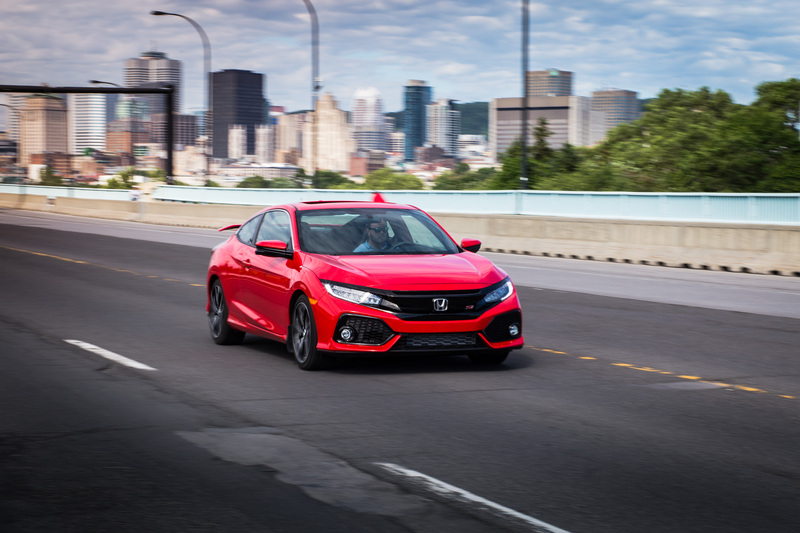 The standard gas-filled bushings got replaced by solid-rubber ones for improved reflexes, and for the first time ever in a Civic, the Si gets adaptive dampers, which firm up at the press of a button. That button is Sport mode, and it also hardens the electronically controlled power steering and sharpens up the engine’s throttle response. The entire dashboard also lights up with even more red lights when you do so. Sport mode is where you want your Si to be, turning the car into a true urban performer where it twitches under the slightest steering inputs. This hot Civic will attack a corner with near-nonexistent body-roll, remaining hunkered down to the ground, exhibiting instant turn in, solid braking, and a tendency to claw its way out of a bend under hard throttle thanks to that limited-slip differential – the way Hondas of old used to handle. This is by far the most athletic Civic Si yet. That’s really where this car shines. 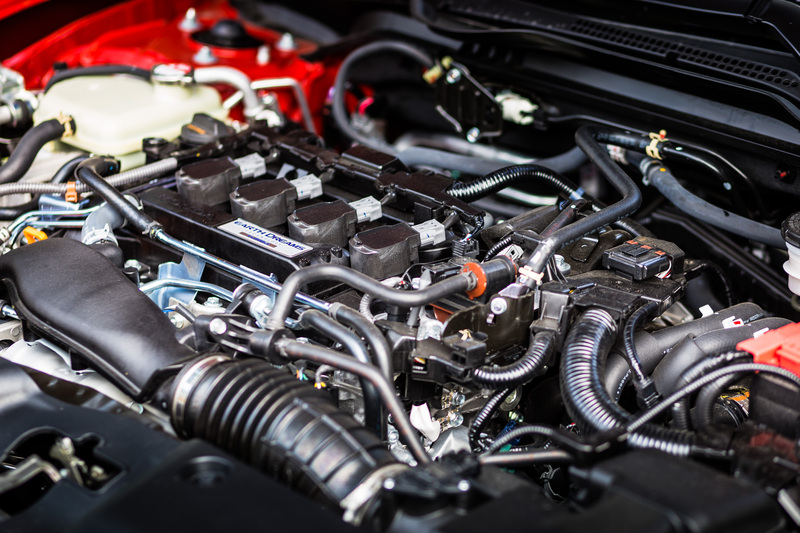 You no longer need to worry about keeping its engine on full boil; you know the power is there, all the time. You can now focus on driving the car, pushing its nimble yet superbly compliant chassis to its limits, and quickly realizing you’re going way too fast in a car that feels all too refined to be wearing a Civic badge. The last time I felt this in a sport compact car, it was behind the wheel of the Volkswagen Golf GTI. The Civic Si is that good. 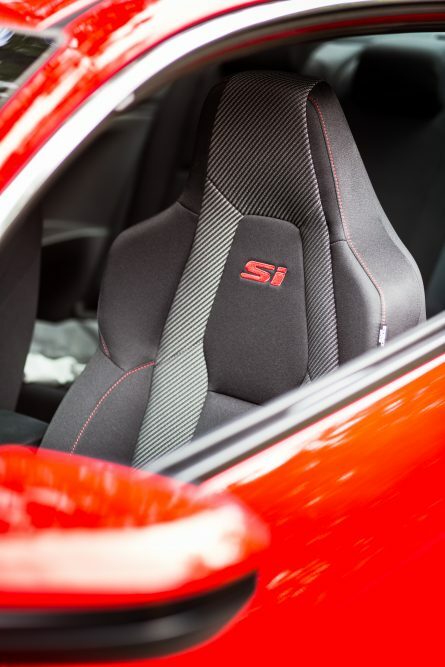 Inside, the Civic Si takes the already well put together and intelligently thought-out ergonomics of the regular Civic and adds Si-specific red stitching and aggressively bolstered sports seats, which look rather cool on top of being supremely comfortable. In typical Si fashion, amber red ligjting dominates the instrumentation. 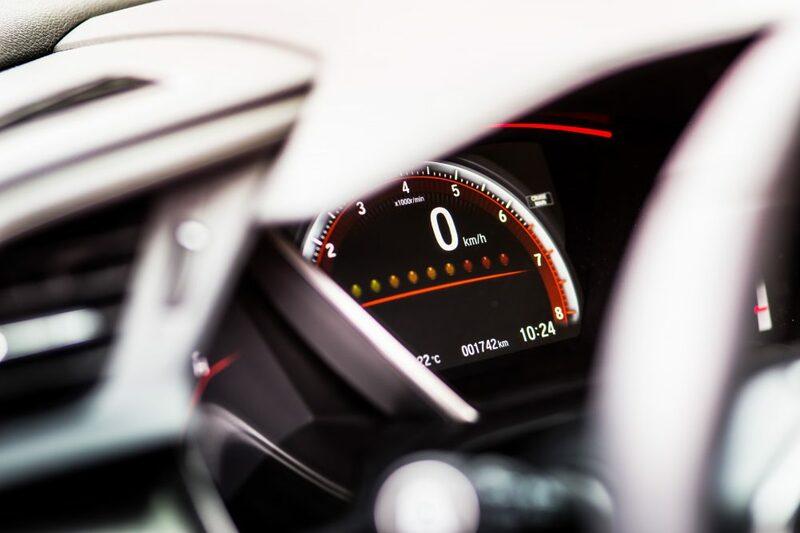 Younger drivers might enjoy the added gimmicks to the standard Civic’s LCD gauge cluster, such as a G-meter, stopwatch, and shift lights. Those should come in handy when the engine hits redline, because, well, you probably won’t hear it as it bounces off the limiter. The Si has always succeeded at balancing everyday driveability and practicality with engaging driving dynamics better than its rivals. And this one continues this tradition. The coupe does sacrifice rear occupant space, but once back there, head and leg clearance aren’t too much of a penalty box for tall adults. Trunk space remains decent at 12 cu-ft, just three cubes less than the Civic sedan. My only large gripe with the Si, and all current Honda products is its touch-operated infotainment system. Honda PR spokespeople must be fed up with me saying it, because I mention it in all my Honda reviews. But it’s awful. When you’re scrambling to find simple controls like changing radio stations while driving, the system is no longer there to help you, but distracts you from the road, making it more dangerous than it should be. And there’s still no volume knob. For the record, as I’m writing this, I’m driving around in a Kia Forte. Honda should buy one and study its infotainment system. Pricing for a 2017 Honda Civic Si is where it sets itself apart from its sport compact car rivals. Value really is the Si’s ace up its sleeve, with only one Si trim available, which sells for $30, 600. While competitors like the Ford Focus ST or Volkswagen Golf GTI start at around the same price range, but require packages for simple options like LED headlights, significantly bloating up the price, the Si comes already loaded as is, with convenience features such as a power sunroof, a 452-watt sound system, wireless Bluetooth charging, LED headlights, foglights, power heated seats, and Honda’s clever Lanewatch system – the cool little camera in the sideview mirror that seas what your mirror can’t. That’s a lot of sport compact car for the price. Sure, you could get a Hyundai Elantra Sport for a bit less money. But its driving dynamics are nowhere near the Civic’s coherent performance package. If you’re crying right now because VTEC is gone, I feel your pain. Don’t worry; there are plenty of second-hand K20 and K24 engines available out there for you to play around with for years. What you have here is the Si of the future. It’s cleaner, more fuel efficient, and more competent than any Si that came before it. Sure, its engine now lacks a bit of soul. But the quintessential Civic Si ingredients remain the same: its fun to drive, easy to live with, and it won’t ruin your budget while doing so. In that respect, I say Honda’s just hit another homerun with this one. Superior handling and refined road composure. Nice write up. Makes me want to trade up from my LX hatch! Hey Martin! How you been? Thanks for reading my reviews! Great review of the Si. I just purchased my first Si after being a loyal Civic(s) owner for 27 years. I would agree with your comments on the Infotainment system. Android Auto seems a little buggy too. “Ok Google” fails to respond anf the system needs to be rebooted (i.e. 4 second power hold down). This will probably be resolved through a software patch. Coming from a tired 2007 EX, the Si is incredible. The power band between 2,100 and 5,000 is fun, but might get me in trouble. The sales person said most Si owners usually get a ticket in their first 6 months. I’m seriously considering the Hondata FlashPro for the Si, which increases HP by 27 and torque by 40. It also allows full throttle shifting without taking your right foot off of the pedal. My only concern is the 6 psi increase in boost and the additional strain it will put on the engine. The MPG rating and creature comforts (still limited) were a big factor in my decision to purchase the Si over the competition (i.e. WRX).